I went to my birthplace Nw. Nickerie today. It’s a 3,5 hour drive from Paramaribo where I live now. It’s been more than 6 years since I last went there so it was about time. I stayed for about 5 hours and then came back to Paramaribo. I had to go for work related stuff. 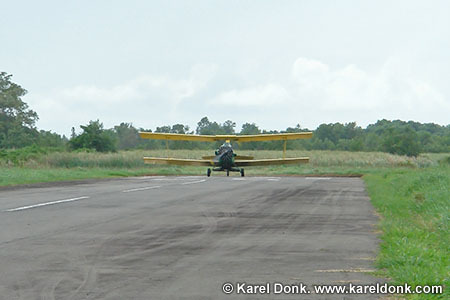 While I was there, I used the opportunity to visit the local airstrip in the afternoon. They have some Ag-Cats (agricultural aircraft first built by Grumman, now by Schweizer) there and I was planning to take some pictures. 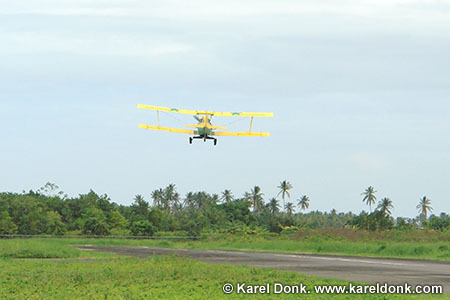 As we were nearing the airstrip, I saw one of the planes landing in the distance, and I got all excited. I didn’t expect them to be working at that time, but this meant I could take even better pictures. You have to understand that I am crazy about the Ag-Cat. I grew up with some kind of obsession with them. I love airplanes and flying in general, but I have additional special feelings for the Ag-Cat. You probably know the feeling a kid in highschool gets when he sees the girl he has a crush on walk up to him. Multiply that by at least 10, and you have the feeling I get when I see a real Ag-Cat in front of me. So seeing one of the planes land in the distance, I went absolutely crazy. As soon as we arrived I got out of the car, grabbed my camera and ran up to the plane. They were busy loading it up again with fertilizer or rice seeds (I didn’t really pay attention to what it was because I was too busy admiring the plane). The design is just beautiful. You can see the pilot and the workers looking at me wondering who I am and why I’m acting so crazy. While it may not look that way in the pictures, the engine was on and idle all the time. Ag-Cat — The design is just beautiful. You can see the pilot and the workers looking at me wondering who I am and why I’m acting so crazy. While it may not look that way in the pictures, the engine was on and idle all the time. Busy loading up the plane. Ag-Cat — Busy loading up the plane. Still loading. The pilot seems to be relaxing and enjoying the break. Ag-Cat — Still loading. The pilot seems to be relaxing and enjoying the break. A peek at the dashboard. Ag-Cat — A peek at the dashboard. After about 10 minutes it was loaded up and ready to go. The pilot is looking around making sure all is clear and applies thrust. The sight and sound made my heart beat so much faster. Ag-Cat — After about 10 minutes it was loaded up and ready to go. The pilot is looking around making sure all is clear and applies thrust. The sight and sound made my heart beat so much faster. Turning around and heading for the runway. Ag-Cat — Turning around and heading for the runway. Turned around and now applying full thrust. Ag-Cat — Turned around and now applying full thrust. Picking up speed quickly. The noise was incredible as I backed away from the runway. Ag-Cat — Picking up speed quickly. The noise was incredible as I backed away from the runway. Beginning to lift up from the ground. Ag-Cat — Beginning to lift up from the ground. And away he goes. Beeee-youtiful! Ag-Cat — And away he goes. Beeee-youtiful! Another one that’s being worked on in a hangar nearby. Ag-Cat — Another one that’s being worked on in a hangar nearby. Even more Ag-Cats with the most common colors (yellow/gray). Ag-Cat — Even more Ag-Cats with the most common colors (yellow/gray). This alone made my trip worth it. For the next few minutes I was totally high from the experience; my driver must have thought I lost it. I want to go back soon and spend more time there and take more and better pictures. And that’s it. I’m still very high from all of this, so I think it’s best if I go lie down right now and take some rest. Update: If anyone from Microsoft reads this, please get this plane into the next version of Flightsimulator! Update: We now have a very realistic Ag-Cat model for Flight Simulator!! Update July 10, 2010: If you want to see the exact same airplane above in action right where I made these pictures, check this video on YouTube! This entry was published on Tuesday, January 9th, 2007 at 8:14 pm by Karel Donk and is filed under General Personal Photography. You can use the permanent link to bookmark and/or share it. There are 33 responses. Follow any responses to this post through its comments RSS feed. You can leave a response, or trackback from your own site. As a fellow pilot I have to say you are one sick puppy if you love those BUF,s! I always ran out of the house in the early morning and afternoon when they would fly over my house. 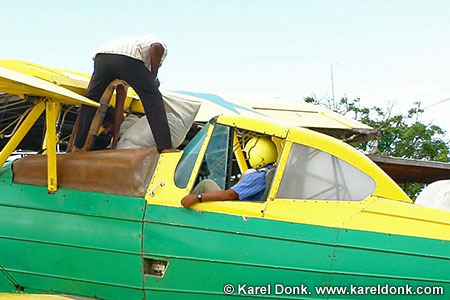 I knew some of the pilots so sometimes they’d wave to me with their hands or wings or fly around and I’d be in heaven! Hi Karel I stumbled on your site looking for pictures of the Ag Cat. I see you are plane crazy. LOL! If you go to Avsim and do a search in that sites library for Leonidas Theofilopoulos and or AgCat G-164 you should find a nice AgCat. I have only seen about 3 different AgCats modeled for flightsim so far. The one modeled by Leonidas Theofilopoulos is the best one I have found so far. He modeled it very nicely. I,m not sure if it will work in FSX but it does work in FS9 or FS2004 The visual model is excellent IMO. I did find I needed to tweak the power settings a little a bit though. I also aliased it’s sound to a nice radial engine sound I downloaded also. You can get better performance if you drastically reduce it’s weight in Flight Simulator. Since you like the Agcat so much, I wanted to point you where you can find a nice one if you haven’t already seen this one. Try this link to the avsim library and put the word AgCat into the search space. It should take you directly to the page so you can download it and put it into the game. Thanks Dave. I looked it up and the model is a bit old looking. But thanks for the info. Hey Karl, I probably wouldn’t have checked back with you but a new AgCat just came out and I stumbled across your website again looking for drawings for a turbine AgCat. So low and behold I found another one for you. It just came out. I believe it is for FS9 and FSX. There are three different downloads to choose from. Three different models. One a crop duster version. One author did all three of the models. They are all red colored. 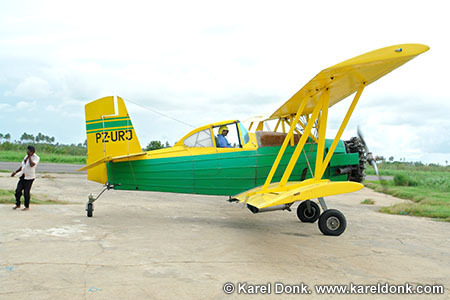 I have put in a request that someone do a factory green and yellow factory paint for the cropduster. Have to wait and see if someone will do it though. 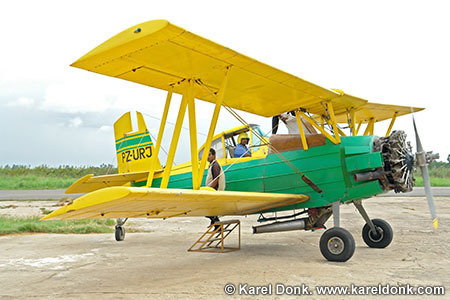 To bring this cropduster to life it really needs a re-paint and needs a good radial engine sound file for it and it will be a perfect model of the AgCat. The cropduster one is the best IMO. It really comes to life though if you know how to alias the sound to a good radial engine sound though. or even put a complete radial engine sound file in it. Having the right sounds for a model can really add life to a model. These AgCats are in both FSX and in FS9 list. You choose for the game you have. 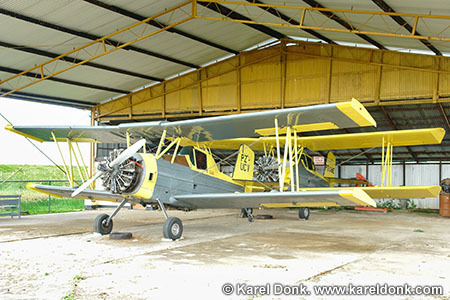 The Cropduster model is the one with the cockpit canopy on it. Make sure the download title has Cropduster in it, because there are three, and you want to make sure to get that one at the least. The model is by default set for heavy nose down trim, so when you get airborn make sure you trim it for hands off level flight, or else you may get the impression it doesn’t fly right. Oh yes, That first model I gave you reference to the other week is a very good model, it is painted to look weathered. Thus it looks old. I do not use FSX so I don’t know if ithat one will work properly in FSX, but it flys real good in FS9. I hope you enjoy this new red cropduster one that just came out for FS9 and FSX. The author of the red cropduster says he will try to do a turbine agcat if someone can find three view and some measurements, so there might be one of these looking ahead. I fly a Walter Turbine Super “B” AgCat in the midwest. 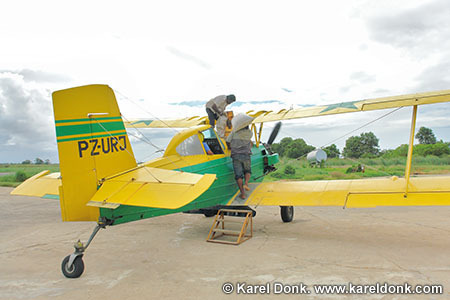 They are toughest, safest, Ag plane in the business. I have the greatest job in the world. Where else can person work 4 months out of the year flying a plane 5 foot off the ground dodging trees, houses, and power lines…and on top of that make a good living. Aerial spraying is the only place I know where you can do this. Wow, the memories….. 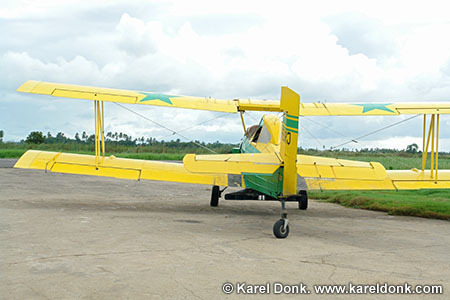 I grew up in the duster community as my father was a cropduster and my uncle. 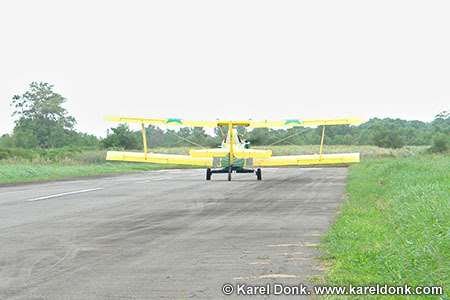 They both flew Ag-cats (my uncle still owns one ). My father dies when his Cat went down in P.R. in 1971. I\’ve been looking for a good Ag-Cat ad on for FSX but so far the ones I\’ve found don\’t work very well with FSX. Hi mark here. 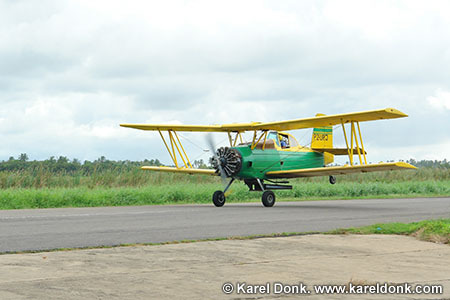 My first love is the Stearman crop dusters. A 450 wrecked in my dads cotton field when I was 5yrs old (1966) in Oro loma CA. Ag Air had a bunch of them. The last one to work one was Spain Air in Dos Palos CA (super 600 with full cockpit cover) in 1980. All gone now. I’ll take a super 600 Ag Cat and work it right now. Hope to buy one to use to fight grass fires in Oklahoma soon. hey Karel, I live at an airport in Iowa, and my dad is putting metal on the wings on a AgCat. The owner has an ariel spraying buissness and has 6 or 7 AgCats. I’m just as crazy about them as you are. I hope to buy one and restore it. I’m looking for a paper model of one. Would you know where to get one? Great photos! I have had a love affair with the Ag Cat ever since the first time I saw one in 1972. I am finally going to get to ride in one this year (2010) . I have found some in the USA that have been converted over to take passengers. 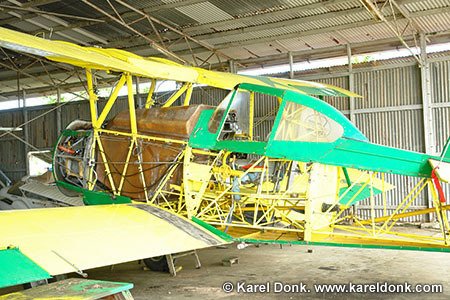 The hopper has been removed and a bench seat has been installed in its place.It will seat two passengers plus the pilot in the rear. I can’t wait for the weather to warm up so I can go! I have been wanting to do this for years! Nice photos. I’ve not seen the blue-green color scheme before. Somehow it fits in nicely with the scenery. I have both a G-164B *and* a Stinson. Glad to know I’m not the only plane geek around that admires these great aircraft. I have two Grumman Ag-Cats (50s models) and one GW Stinson. 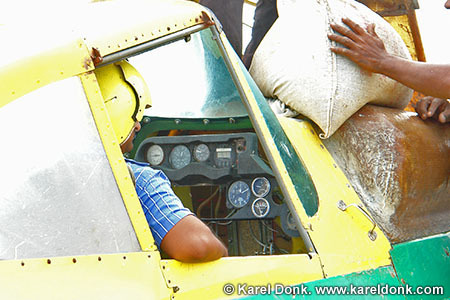 I loaded, fueled, cleaned the Ag planes while growing up. I also helped with maintenance for years during off-season. Oh, I’m going to check out the Flight Simulator now that I know it has the Ag-Cat. Hey, check out my website for Ag Cat and other ag photos. I love agcats. I am starting out in ag in a “B” model cat with a PT6-20. Wonderful flying a/c. Texas Spartan, do you have photos of those old cats????? I’ve got better than 1500 hrs in 600 (hp) Cats. It is a wonderful airplane and remains one of my favorites. There was nothing better than getting up just before dawn, walking into the hanger and rolling the airplanes out for the day. Then, after loading and fueling, being airborne as the sun came up over the horizon. One of the quirks of the Ag-Cat is the odd nose-down angle in level flight. If you hold the nose of a Cat on the horizon, you have established a serious angle of climb. It takes a bit of getting used to, but once you have a few hours in the bird, it seems perfectly natural. The Piper Brave has the same downward slope on the nose. The result of this angle is a great view over the nose in level flight, something few biplanes like the Stearman can claim. Four ailerons and short coupling, provide the Cat with an impressive turn radius. An empty cat will virtually pivot on a wing tip and ag turns with ULV loads can be truly aerobatic with hammerheads not being uncommon among experienced pilots. I have flown aerobatic aircraft that were not as responsive to control input as the Cat. Until the Ag-Cat, Grumman had never produced anything like this airplane. Their pre-war biplane fighters of the 1930’s were very different in design planform from the Cat. However, one can clearly see the Ag-Cat’s true heritage in Boeing’s F4B-2. I find it ironic that the F4B was Boeing’s last biplane fighter and was supplanted by a Grumman product. The Ag-Cat was Grumman’s last biplane and the last in a long line of fighters named after cats, a line that began with a plane that replaced the Boeing F4B as the Navy’s frontline fighter. I really got as kick out of flying the FSX Ag-Cat. It was great to look down and see the “money handle” exactly where I had left it. Even the vent tubing and hopper baffling can be seen through the hopper glass, which seems odd because the sight glass was never that big or that clean. My first ride in a Cat was as a passenger. I was being ferried out to a remote strip to load. I stood up in the empty hopper with my head out of the aft loading hatch, which had been removed and set in the bottom of the hopper. It was an exhilarating ride to say the least. While the sim does not reproduce the nose-down feel of the real aircraft, everything else is pretty much spot on. We never flew with the doors on, even in winter, so I just leave the doors down on the sim. Our aircraft had WWII style instruments. Of note were the three-in-one gauge for oil and fuel operating parameters, the MAP gauge and the Tachometer. I cannot remember seeing a working flight gage or nav instrument in an ag aircraft, but the engine gauges always worked. We never used the fuel gauges, we always flew by time, but with the usual water work, this was a moot point because we would refuel with every load anyway. There were no gross weight limitations, you would just fill it to the brim with everything and takeoff. When you were loaded with water, the first few turns were made pretty flat, primarily using rudder. As the plane got lighter, the turns got steeper. I noticed in the video the guy taxied out for takeoff. I was almost fired for doing that very thing. There was one ironclad rule – always land and takeoff in relation to arriving and departing the loading pumps. Likewise you always make wheel landings, never three pointers as, like taxing, this waste too much time. Most ag strips are laid out perpendicular to the prevailing wind so you usually have crosswind landings and takeoffs, but many times I taken off and landed with fifteen to twenty knots of tailwind. For downwind takeoffs you simply bump the plane few feet into ground effect and then stay there until you have enough speed and lift for climb-out. Another rule is, unless absolutely necessary, always fly under or around, and never over an obstacle. Obstacles are much easier to see and judge when they are silhouetted against the sky as opposed to the ground. One of the main strips I operated from had a high-tension tower smack at the end of the runway. Since we always took off and landed in one direction, we would always take off and then jink around the base of the tower. Same with landing, we would always fly under the wires and around the tower to land. That strip had wires all around the runway and as is typical of most ag strips, it was just long enough to operate from. 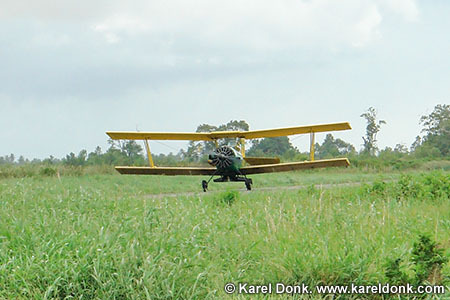 Ag flying is like no other flying. Unless ferrying, one seldom flies above 250 feet. If had had done other aircraft what I commonly did in ag aircraft, the Feds would have tracked me down, locked me up and thrown away the key. Flying under bridges, down freeways, under wires, across roads, in between traffic, around water towers, perpendicular and right up to the active runways of major airports and even some distance down the main street of small and mid-sized towns, ag-pilots break almost every rule in the book because if they didn’t, they couldn’t do their job. Ag flying is all stick and rudder and out of more than 2700 hrs in everything from jets to DC-3s, it was undeniably the last, truly free form of flight possible. Until I flew this sim, I had forgotten how much I really enjoyed my time flying ag. It really tickles me doing the old back and forths across fields in locations where I actually flew. One noticeably missing element are the flaggers. Today its all GPS nav, but when I flew, we had to know the fields and we had flaggers that would pace off thirteen steps (the wingspan of the Cat)with every swath run, always into the wind of course. It sure would be neat to see a flagger at the end of the field waving his/her white flag to mark the swath run. Yes I agree this would be nice, but it would require a lot more programming, possibly in the original game code and only Microsoft is able to do this. Sadly I don’t think they’re going to look at this. I do remember playing a very old version of Flightsimulator back in the MS-DOS days (version 3 or 4), and there they had crop dusting as a feature in the game and the areas of the field that you sprayed would turn a different color. I found this page while seaching Suriname. I lived there in mid 1980 and my Dad was sent there to repair Ag Cats. 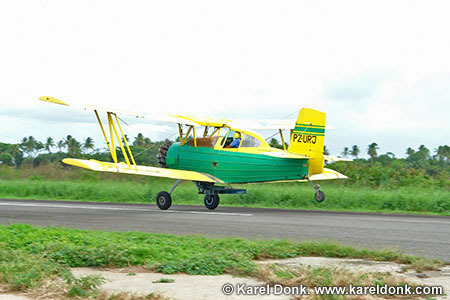 It was a wonderful experience living in Nickerie and Suriname. We lived on Cassaveweg street. My Dad’s co-worker was Henk Wolters. We spent a lot of time at their home. Couldn’t see the photo; perhaps it is private?